Newcomer Family Obituaries - Beulah G. Trouten 1932 - 2019 - Newcomer Cremations, Funerals & Receptions. 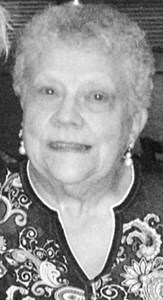 Beulah G. Trouten, age 86, of Rossford, passed away February 4, 2019 at Manor at Perrysburg. Beulah was born April 18, 1932 in Bonne Terre, MO to Oscar and Maudie (Dreier) Cureton. Beulah was a member of Kingdom Hall of Jehovah''s Witnesses. She enjoyed spending time with her family and reading the Bible. In addition to her parents, Beulah was also preceded in death by a step-son, Jeff Trouten and brother, Darrell Cureton . She is survived by her loving husband, William Trouten, Jr., children, Cheryl (Stan) Kolebuck, Gayla (John) Badger, Kim Friar, Kathy (Greg) Wolff, Kris Everitt, step-children, Bethann Leach, William (Sally) Trouten, III, Ricky (Bobbi) Trouten, Donald Trouten, sisters, Marlene Voelker, Denise Cureton; 11 grandchildren and six great grandchildren. The family will receive guests Sunday, February 10, 2019 from 2:00 pm - 8:00 pm at Newcomer - Northwest Chapel, 4150 W. Laskey Rd. (419-473-0300). Funeral Services will begin Monday at 10:00 am. at the funeral home followed by burial at Roselawn Memorial Park, LaSalle. Memorial contributions may be made to American Cancer Society or a charity of the donor's choice in Beulah's memory. Add your memories to the guest book of Beulah Trouten. Please accept my heartfelt condolences on your mother’s passing. Sending our deepest sympathy to all the family, In the loss of your mother. Cliff and Bea Friar. Our sincere condolences to the Trouten family. We are sorry to hear of the loss of your mother, she will be greatly missed by her family. We pray that you find comfort and be strengthened by these two verse from the book of Lamentations and 1 Timothy. -I will never forget this awful time, as I grieve over my loss. Yet I still dare to hope when I remember this: The faithful love of the Lord never ends! His mercies never cease. Great is his faithfulness; his mercies begin afresh each morning. I say to myself, “The Lord is my inheritance; therefore, I will hope in him!” The Lord is good to those who depend on him, to those who search for him. Kris, Kathy, Greg and families. Our thoughts and prayers are with you at this difficult time in your lives. Blessings to you all. Through the different seasons of life peacewithGod.net has been a source of hope & encouragement and we thoughtfully share as you remember the life of Beulah. We were saddened to hear of the passing of Beulah. Now and in the days ahead, may Jesus our God of comfort embrace you with His loving arms as you remember and celebrate her life legacy. She will not be forgotten in the hearts of all who knew her. Earth has no sorrows that Heaven cannot heal.